Find Mobile Notary Publics Nationwide! We are more than just a signing service… Sunshine is your “Your Virtual Scheduling Department” with Over 36,000 Attorneys and Notaries Nationwide! Last Minute Orders are A – OK! We guarantee to increase your productivity and profitability when it comes to finding a mobile notary or attorney NATIONWIDE for any and all Signing Request! All Closers undergo Background checks. We specialize in finding the most qualified individual for your signings. We have state of the art software where you can enter your orders, upload documents and track all the vital details of your closing. We are available to do closings 24/7, 365 days a year. There is always a friendly voice to answer the phone at our mobile notary service. We cover the entire country including attorney states! Don’t spend unnecessary payroll costs and time trying to find a qualified notary. Spend more time focusing on closing more orders. We have years of experience in vetting the right notary so you don’t have to. Our mobile notary service will eliminate the extra stress and overhead that is associated with these additional tasks. To stay CFPB compliant you must retain pertinent records of your vendors. We collect and verify licenses, insurance, background screenings and more on all of our hired vendors. Leave this tedious task to us. When you use Sunshine you can focus on client relations. Giving you the time needed to focus on client satisfaction. You will also free up more time to market your services to increase your production and profits. It takes a lot of time following up with vendors on changes, questions and concerns. We will handle that for you. Most questions we can handle internally. In the event we need to clarify questions with you, you can feel confident and assured that you only have to deal with one office instead of numerous unnecessary and timely calls from hundreds of other vendors. Our mobile notary service always has a qualified staff member on call to handle after hours signings. We will field these calls and problem solve issues, including calling the appropriate parties as needed to facilitate the customers’ needs and answer questions needed from the table. This will help ensure a successful signing. 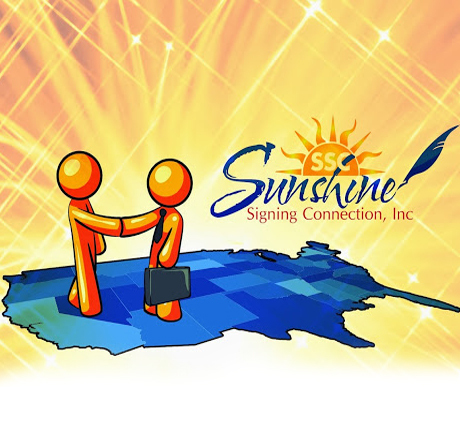 We have been working with Sunshine Signing for years.. and I must say that their service is impeccable. Over the past few years we have come to view Sunshine Signing as a part of our company. They are our virtual scheduling department. The interaction is seamless and reliable. Sunshine Signing Connection online notary software and knowledgeable staff are two key elements for a smooth real estate closing each and every time. Need a Mobile Notary Service? What are you waiting for!